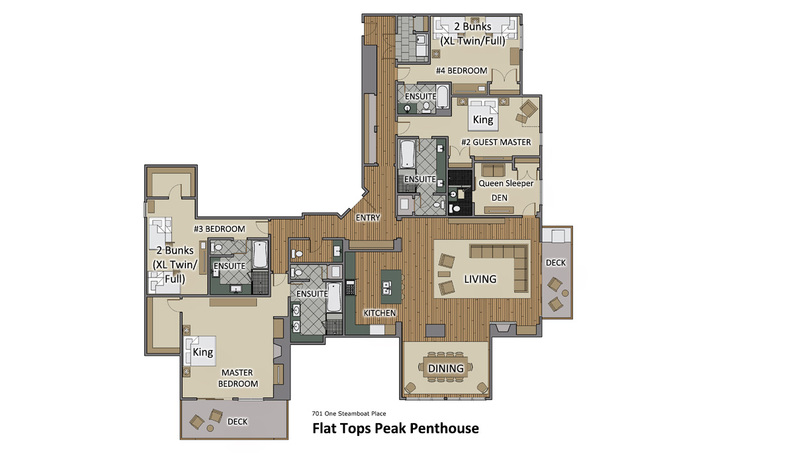 Walk into Flat Tops Peak Penthouse and you will be drawn to the vaulted ceilings that add special grandeur and magnificent space to this fabulous residence. This magnificent home is a vibrant and modern residence with a premium view of the Steamboat ski mountain and Yampa Valley. The contemporary mountain feel of Flat Tops Peak Penthouse is warm and inviting for families and groups seeking a comfortable, special place to stay in Steamboat Springs. This spectacular home offers an open floor plan that connects the living and dining areas to the kitchen with plenty of room for the entire group to gather. The professionally equipped kitchen with Viking appliances will delight any aspiring chefs; or grill at your leisure in the great outdoors at the built-in Viking gas grill on the balcony. There is seating for 10 at the large dining room table and additional seating for 3 at the kitchen bar, so entertaining with guests is a temptation you can easily indulge. There are five bedrooms, all with private bathrooms. The Master bedroom with King bed offers a gas fireplace and the master bath features a steam shower and Jacuzzi tub, as well as a private deck. The Guest Master has a King bed, large bathroom with double sinks. The 3rd and the 4th bedroom offer two sets of Twin over Full bunk beds each. There is also a 5th bedroom with a queen sleeper sofa and a full bathroom. All One Steamboat Place residences feature luxurious furnishings and décor throughout the home. The home office boasts an iMac home computer & high-speed Wi-Fi, allowing Internet service for all guests. A printer is available at the front desk, and guests can also videoconference with the front desk from the home office. My family and my sister's family stayed in this property over New Year's. We had a wonderful time skiing at Steamboat and visiting the town. The property itself is beautiful and spacious. There were 8 of us (4 teenage kids and 4 adults), and we all had plenty of space. The staff at One Steamboat Place were helpful, particularly in arranging local transportation and in scheduling dogsledding, dinner reservations and other activities. We would definitely return.